Maryem Ansari Assistant Professor, Dept. of Pathology, SMSMC, JAIPUR. Alka Mittal Assistant Professor, Dept. of Pathology, SMSMC, JAIPUR. Jayanti Mehta Professor, Dept. of Pathology, SMSMC, JAIPUR. Niharika Jain Resident, Dept. of Pathology, SMSMC, JAIPUR. Background: Breast cancers have been subclassified on the basis of molecular expression. 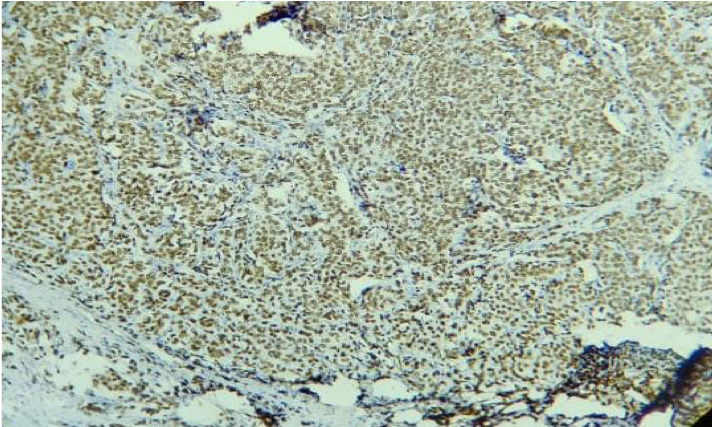 This study evaluates the receptor expression in breast carcinoma by immunohistochemistry and classifies them into various subtypes. A comparison with other regions was also made. Methods: This prospective study included all the patients of breast carcinoma who had undergone the surgical treatment of mastectomy at SMSMC from January 2014 to June 2017. Immunohistochemical expression of estrogen receptor (ER), progesterone receptor (PR), and human epidermal growth factor receptor-2 (HER-2) was studied and subtypes were determined. Comparison of the receptor expression and patterns was done in different age groups and with other regions. Results: ‘A total of 496 cases were included in this study. The mean age at diagnosis was 48.2 years. Most of the patients (60.3%) were less than 50 years old whereas 39.7% were above 50 years. By Bloom Richardson scoring 28.7%, 56.8% and 14.5% tumours were classified as Grade I, Grade II and Grade III respectively. ER, PR and HER2neu receptor positivity was seen in 57.5%, 44.1% and 26.6% respectively. The most common molecular subtype was luminal A (41.7%) followed by triple negative subtype (30.8%). Luminal B and HER2neu overexpressing types were 15% and 12.5% respectively. Conclusion: Immunohistochemical markers act as surrogate markers for molecular classification of breast cancers. Hormone receptor expression at our institute was comparable with other studies from India. Luminal A is the most common occurring subtype of breast cancer presenting at our institute. 1. Allred DC, Harvey JM, Berardo M, Clark GM. Prognostic and predictive factors in breast cancer by immunohistochemical analysis. Mod Pathol. 1998;11:155-68. 2. Wolff AC, Hammond ME, Hicks DG et al. Recommendations for human epidermal growth factor receptor 2 testing in breast cancer: American Society of Clinical Oncology/College of American Pathologists clinical practice guideline update. Arch Pathol Lab Med. 2014 Feb; 138(2): 241–256. 3. Vidhya Lakshmi S, Seyed Rabiya. “An Analysis of Changing Trends in the Epidemiological Pathological and Receptor Expression of Breast Cancers Treated in a Tertiary Care Hospital in South India”. J Evol Med Dent Sci. 2014;3(69) 14824-34. 4. Patnayak R, Jena A, Rukmangadha N, et al. Hormone receptor status (estrogen receptor, progesterone receptor), human epidermal growth factor-2 and p53 in South Indian breast cancer patients: a tertiary care center experience. Indian J Med Paediatr Oncol. 2015;2 (36):117–22. 5. Azizun-Nisa, Bhurgri Y, Raza F, Kayani N. Comparison of ER, PR and HER-2/neu (C-erb B 2) reactivity pattern with histologic grade, tumor size and lymph node status in breast cancer. Asian Pac J Cancer Prev. 2008; 9,553-6. 6. Geethamala K, Murthy VS, Vani BR, Sudharao. Hormone receptor expression in breast carcinoma at our hospital: an experience. Clin cancer Investig J. 2015;4 :511-15. 7. Sughayer MA, Al-Khawaja MM, Massarweh S, Al-Masri M. Prevalence of hormone receptors and HE2/neu in breast cancer cases in Jordan. Pathol Oncol Res. 2006;12, 83–6. 8. Almasri NM, Al Hamad M. Immunohistochemical evaluation of human epidermal growth factor receptor 2 and estrogen and progesterone receptors in breast carcinoma in Jordan. Breast Cancer Res.2005;7,598-604. 9. Munjal K, Ambaye A, Evans MF, Mitchell J, Nandedkar S, Cooper K. Immunohistochemical analysis of ER, PR, Her2 and CK5/6 in infiltrative breast carcinomas in Indian patients. Asian Pac J Cancer Prev. 2009; 10: 773-8. 10. Desai SB, Moonim MT, Gill AK, Punia RS, Naresh KN, Chinoy RF. Hormone receptor status of breast cancer in India: a study of 798 tumours. Breast. 2000; 9, 267–70. 11. Puvitha RD, Shifa S. Breast Carcinoma, Receptor Status and Her2 neu Expression Revisited. Int J Sci Stud 2016;3(10):52-58. 12. Shet T, Agrawal A, Nadkarni M, et al. Hormone receptors over the last 8 years in a cancer referral center in India: What was and what is? Indian J Pathol Microbiol 2009; 52(2): 171-4. 13. Yadav R, Sen R, Chauhan P. ER, PR, Her2/neu status and relation to clinicopathological factors in breast carcinoma. Int J pharmacy pharmaceutical sci . 2016; 8(4): 287-290. 14. Ambroise M, Ghosh M, Mallikarjuna VS, Kurian A. Immunohistochemical profile of breast cancer patients at a tertiary care hospital in South India. Asian Pac J Cancer Prev 2011;12:625-9. 15. Rhodes A, Jasani B, Balaton AJ, Barnes DM, Miller KD. Frequency of oestrogen and progesterone receptor positivity by immunohistochemical analysis in 7016 breast carcinomas: correlation with patient age, assay sensitivity, threshold value, and mammographic screening. J Clin Pathol. 2000; 53,688-96. 16. James R, Thriveni K, Ramaswamy G,et al. Evaluation of immunohistochemistry and enzyme linked immunosorbent assay for her-2/neu expression in breast carcinoma. Ind J Clin Biochem.2008; 23, 345-51. 17. Vaidyanathan K, Kumar P, Reddy CO, Deshmane V, Somasundaram K, Mukherjee G. ErbB-2 expression and its association with other biological parameters of breast cancer among Indian women. Indian J Cancer. 2010; 47:8-15. 18. Kumar V, Tewari M, Singh U, Shukla HS Significance of Her-2/neu protein over expression in Indian breast cancer patients. Indian J Surg. 2007; 69;122-28. 19. Vogel UF. Confirmation of a low HER2 positivity rate of breast carcinomas - limitations of immunohistochemistry and in situ hybridization. Diagn Pathol. 2010;5:50. 20. Elidrissi Errahhali M, Elidrissi Errahhali M, Ouarzane M, Harroudi TE, Afqir S, Bellaoui M. First report on molecular breast cancer subtypes and their clinico-pathological characteristics in Eastern Morocco: series of 2260 cases. BMC Women's Health. 2017; 17 (1):3. 21. Seshie B, Adu-Aryee NA, Dedey F, Calys-Tagoe B, Clegg-Lamptey J. Retrospective analysis of breast cancer subtype based on ER/PR and HER2 status in Ghanaian patients at the Korle Bu Teaching Hospital, Ghana. BMC Clin Pathol. 2015;15:14 . 22. Rashed MM, Ragab NM, Galal MK. The association of HER2/neu over-expression in relation to p53 nuclear accumulation, hormonal receptor status and common clinicopathological prognostic parameters in a series of Egyptian women with invasive ductal carcinoma. Eur J Gen Med .2007;4:73-9. 15. 23. Al-nuaimy WMT, Ahmed AH, Al-nuaimy HAA Immunohistochemical Evaluation of Triple Markers (ER, PR and HER-2/neu) in Carcinoma of the Breast in the North of Iraq. Don J Med Lab Diag. 2015;1(1) :52-60. 24. Ayadi L, Khabir A, Amouri H, et al Correlation of HER2 over-expression with clinico-pathological parameters in Tunisian breast carcinoma. World J Surg Oncol.2008; 6,112. 25. Verma S, Bal A, Joshi K, Arora S, Singh G. Immunohistochemical characterization of molecular subtypes of invasive breast cancer: a study from North India. APMIS 2012; 120: 1008–19 . 26. Shushan SJ, Kusuma V, Geethamani V. Immunohistochemistry for ER/PR and HER-2/neu in breast carcinoma-their interrelationship and association with histopathological grading and clinical parameters. Int J med applied sci. 2013; 2(1):107-17. 27. Pervaiz F, Rehmani S, Majid S, Anwar H. Evaluation of Hormone Receptor Status (ER/PR/HER2-neu)in Breast Cancer in Pakistan. J Pak Med Assoc.2015; 65(7):747-752. 28. Abdelkrim SB, Trabelsi A, Missaoui N, et al. Distribution of molecular breast cancer subtypes among Tunisian women and correlation with histopathological parameters: a study of 194 patients. Pathol Res Pract. 2010;206(11):772–75. 29. Cherbal F, Gaceb H, Mehemmai C, et al. Distribution of molecular breast cancer subtypes among Algerian women and correlation with clinical and tumor characteristics: A population-based study. Breast Dis. 2015;35(2):95–102. 30. Fourati A, Boussen H, El May MV, et al. Descriptive analysis of molecular subtypes in Tunisian breast cancer. Asia Pac J Clin Oncol. 2012;10(2):e69–74. 31. Ly M, Antoine M, Dembélé AK, et al. High incidence of triple-negative tumors in sub-saharan Africa: a prospective study of breast cancer characteristics and risk factors in Malian women seen in a Bamako university hospital. Oncol. 2012;83(5):257–63. 32. McCormack VA, Joffe M, van den Berg E, et al. Breast cancer receptor status and stage at diagnosis in over 1,200 consecutive public hospital patients in Soweto, South Africa: a case series. Breast Cancer Res. 2013;15(5):84. 33. Yang XR, Sherman ME, Rimm DL, et al. Differences in Risk Factors for Breast Cancer Molecular Subtypes in a Population-Based Study. Cancer Epidemiol Biomarkers Prev. 2007;16(3):439–43. 34. Awadelkarim KD, Arizzi C, Elamin EO, et al. Pathological, clinical and prognostic characteristics of breast cancer in Central Sudan versus Northern Italy: implications for breast cancer in Africa. Histopathology. 2008;52(4):445–56. 35. Puig-Vives M, Sánchez M, Sánchez-Cantalejo J, et al. Distribution and prognosis of molecular breast cancer subtypes defined by immunohistochemical biomarkers in a Spanish population-based study. Gynecol Oncol. 2013;130(3):609–14. 36. Al bedairy IHM, AL.Azzawie HF, AL-Kazaz AK, Ghanim M. Immunohistochemical evaluation of human epidermal growth factor receptor 2 and estrogen and progesterone receptors in Iraqi breast carcinoma women. Int J Adv Res.2014; 2(6): 168-177. 37. Gluck S, Snoo F, Peeters J, Sloots LS, Somlo G. Molecular subtyping of early-stage breast cancer identifies a group of patients who do not benefit from neoadjuvant chemotherapy. Breast Cancer Res Treat. 2013;DOI: 10.1007/s10549-013-2572-4. 38. Yanagawa M, Ikemot K, Kawauchi S, et. Al. Luminal A and luminal B (HER2 negative) subtypes of breast cancer consist of a mixture of tumors with different genotype .BMC Research Notes.2012; 5:376. 39. Cintra JRD, Teixeira MTB, Diniz RW. Immunohistochemical profile and clinical-pathological variables in breast cancer. Rev Assoc Med Bras 2011; 58(2):178-187. 40. Voduc D, Cheang MCU, Tyldesley S, Gelmon K, Nielsen TO, Kennecke H. Breast Cancer Subtypes and the Risk of Local and Regional Relapse. J Clin Oncol. 2010; 28 :1684–91.